Have you seen The Witch? I have. And I think it's dang good. Then, sometime months and months and months ago (shortly after I saw the movie for first time), Blake's announced an autumny cider based upon one if its characters: Black Phillip, who is a goat (well, in a manner of speaking--I don't want to spoil the flick for those of you who haven't seen it). After Blake's' announcement, I constantly monitored the cidery for updates on Black Phillip's release. And then, finally, it happened. And I search for it here. After finding nothing, I waited patiently and search again. And again. And again. But to no avail. I even looked in Michigan grocery stores (Blake's is based in Armada, MI). Still no luck. Then, during my vacation last month, long after I had given up all hope of finding the cider, I spotted it on the bottom of a shelving unit in the Athens, OH Kroger. Without a second thought I snatched up a sixer. I've been drinking it steadily since then, but wanted to save my final can of it for the full John Likes Beer treatment. Is it good? Well, if you'll let me spoil it in advanced of the full review below, yes. Now you'll have to read on just find out how good it is. I've written about Blake's a few times already this year, so, if you've been around here for a bit, you may know about the cider company a little. If you're new or haven't been paying attention, here's the scoop: The cidery's orchard has been in operation for 69 years and has over 45,000 trees that produce 42 varieties of apples. They then use all these apples to make 19 unique hard ciders. You should totally check out their website, which is full of more information (including their new winter seasonal, Archimedes, which looks great. I just hope hasn't rendered Wayward Winter obsolete). 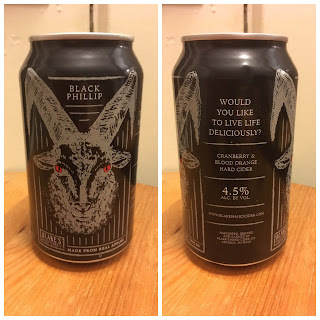 According to the short write-up of Black Phillip on Blake's' seasonal "Ciders" page, its an award winning, semi-sweet cider brewed with cranberries and blood orange that clocks in at 4.5% ABV. That's it. From Black Phillip's aroma, I'm getting cider with just a hint of cranberry--not much citrusiness from the blood orange here at all. I think it smells vaguely of Thanksgiving (we have cranberries with our dinner and apple pie for dessert), so I like it a lot. Purrl doesn't. 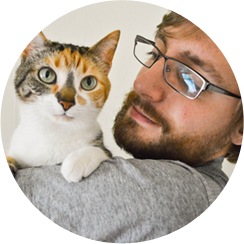 As seen in the photo below, she wouldn't get anywhere near my open can. It gets a full zero whiffs. The cider's flavor profile is really something else. On the fore, I get a tangy bitterness from the cranberries. This is swiftly cut with the sweetness from the apples and the citrus from the blood orange. Then, in the aftertaste, I find a good, crisp apple taste. Excellently crafted. 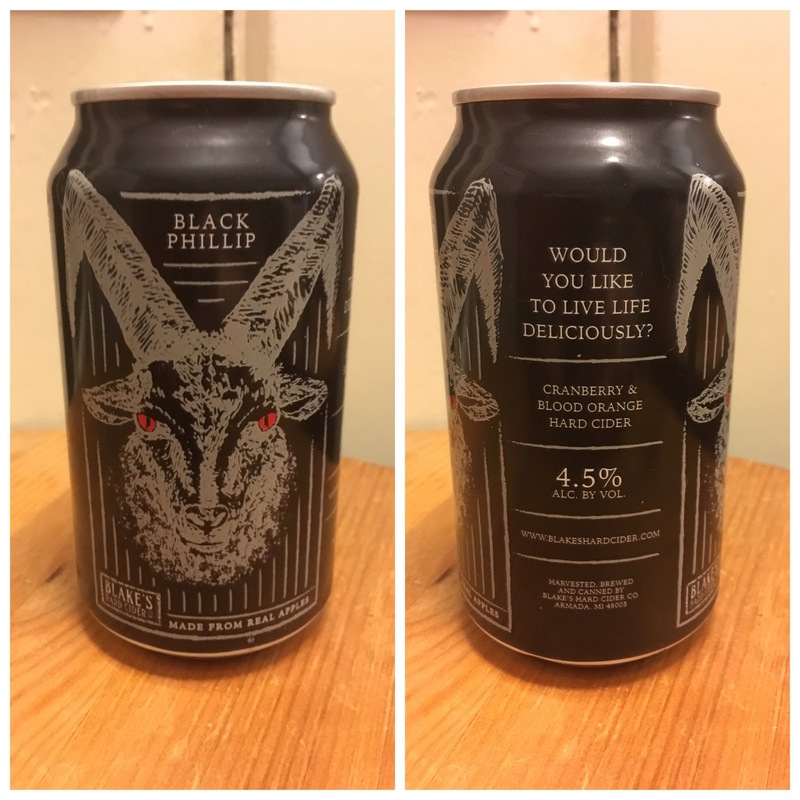 Black Phillip is light and fizzy. Each swig rapidly expands into my mouth is a flurry of bubbles. Sort of like you might guess a witches brew would do? I don't know--I'm grasping at straw for a Black Phillipy analogy here. What I'm not grasping at is the memory the cider in this can brings to my mind. I was on the cross country team in high school. One early fall afternoon, when the air was just beginning to get chilly but overheating could still happen to runners who didn't stay hydrated, we had a practice run through an old farm field (looking back, we were definitely trespassing on private property). This was my favorite place to practice: we ran through the field, passed the old farmhouse and dilapidated barn, and into the woods on the far side of the field. Some distance into the woods, most of the team turned around and headed back to the school, which was where we started practice. The group I was with that day, however, kept going. We made it out of the woods and ran across the open areas and back yards that followed. At one point, we came across a man-made lake in what seemed like the middle of nowhere and took a rest. I vividly remember staring into the placid water and watching the reflections of the clouds float along it. I want to live deliciously. And, thanks to Blake's' Black Phillip, I can do so. I won't beat around the bush with this: I'm giving the cider a 10/10. It's another top quality offering from the cidery and it's definitely worth hunting down before it disappears for the year.